The Dagsbrún Library is a specialized collection of material on the Icelandic labor movement, as well as a general academic social science collection and a reference library for the Reykjavík Academy. The library and it’s collection is available for the public to view at the premises. 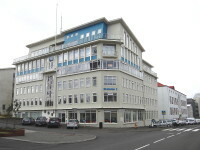 Loans are only available as in-house loans to members of the Reykjavík Academy who have offices in the building. Desks are available at the library for users to use when going through our collection and free wireless Internet is also available. Photocopies of library material can be made at the premises at a low cost. Our librarian can provide information about our collection and can assist with collection of source materials. Efling – labour union is the library's owner but the Reykjavík Academy is it's operator.